The Top Ten Tools of 2007 were judged purely by the traffic each review experienced. The total traffic from 11-1-2006 to 12-1-2007 for each review was averaged to achieve a monthly number for each tool to determine the ranking. Once again, there were several very close races for positions within this years Top Ten list with two positions separated by under 200 visits per month! The Top Ten Tools listed here averaged just over 15,000 visits per month each. The high and low traffic averages came in at 21,100 for the 1st-place POWERMATIC PM2000 to 10,350 for the 10th-place POWERMATIC 3520B wood lathe despite its specialized segment within woodworking. The Tool Reviews section of NewWoodworker.com LLC received just over 1.9 million visits in 2007, up 14-percent from 2006. The POWERMATIC PM2000 10" Cabinet Saw has been a huge hit for POWERMATIC since it was first released and turned out to be just as big of a hit with NewWoodworker.com LLC viewers when I posted the review. My email shows a clear trend of woodworkers stepping up their table saw quality so it is not surprising that the POWERMATIC PM2000 drew the most attention in 2007. The list of POWERMATIC PM2000 features is long with many being exclusive. Of particular interest to NewWoodworker.com LLC viewers are the high-end safety features that are as easy to use as they are effective. The overall quality and the high-end fence system on the POWERMATIC PM2000 also pushed it over the top in popularity. From the moment I opened the box I knew the POWERMATIC PWBS-14 Bandsaw would be a big hit with NewWoodworker.com LLC viewers. The traditional POWERMATIC quality is a big draw to be sure. However, the list of standard features on the POWERMATIC PWBS-14 Bandsaw that other manufacturers consider aftermarket (additional cost) pieces is amazing. Add up the aftermarket costs for the POWERMATIC PWBS-14 Bandsaw standard features and it is a remarkable value that drew lots of attention in 2007! The Beall Tilt Box instantly drew large traffic numbers from woodworkers looking to improve their accuracy at the table saw and other machines. Bealls' reputation for high quality, innovative tools didn't hurt anything either. The simplicity of operation and the range of uses made the Beall Tilt Box of special interest to a surprising number of NewWoodworker.com LLC viewers. The bad news is that one of my setup secrets is now widely known! Learning to make mortise and tenon joints has always been daunting for new woodworkers but the POWERMATIC 701 Benchtop Mortiser has made that a much easier task. Once again the POWERMATIC quality and a full list of user friendly features were attractive to NewWoodworker.com LLC viewers as is the price, especially when extended out over what promises to be a very long life of this machine. The original #4000 version of the Bosch 4100DG-09 Worksite Saw was an instant hit with a large number of woodworkers. Many liked the size and remarkably small storage mode of this saw/stand combination because of their small or temporary shop spaces. What surprised me was the number of established woodworkers who added the Bosch 4100DG-09 (and the #4000 model before it) as a second saw to compliment their full-sized version. The new range of features and the remarkable Gravity Rise stand made the Bosch 4100DG-09 an instant hit. What happens when a manufacturer "updates" a long time favorite machine without cheaping it out? 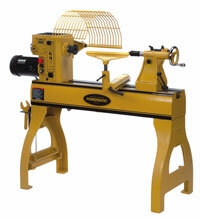 You get the JET 1014I Series Mini lathes. Apparently JET listened to the legions of 1014 users and resisted the seemingly industry-wide urge to save a few bucks. They did add 24-position indexing to both the standard and variable speed versions of the 1014I without removing or messing anything else up! All of our favorite features and qualities remain, as does the value that has made the JET 1014 series lathes a favorite for years. It just stands to reason that electronics would step up in woodworking and the Lumber Wizard III did just that. NewWoodworker.com LLC viewers seem to be shopping for higher end machines more frequently and the idea of protecting the expensive cutters within many of them made the Lumber Wizard III a no-brainer. Its effectiveness, ease of use and reasonable price made the Lumber Wizard III a must-have tool for lots of NewWoodworker.com LLC viewers. JET retained their common sense approach to updating machines while refining their Xacta Saw. This 10" cabinet saw has been at the top of the JET line for some time and the NewWoodworker.com LLC viewers obviously agreed with the new features they added with the release of the Deluxe Xacta Saw. Look closely and you can see some POWERMATIC PM2000 thinking on the new JET Deluxe Xacta Saw. This all new lathe from JET, bolstered by a full set of accessories including a bed extension and heavy-duty stand immediately drew lots of attention from NewWoodworker.com LLC viewers. 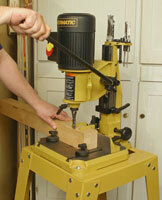 The JET 1220 also became a frequent topic on many woodworking forums. The balance between mini and full-sized lathes, along with typical JET quality and features had lots of our viewers very interested very quickly. It surprised me that a high-end tool from an admittedly specialized portion of the woodworking community could make the Top Ten but the POWERMATIC 3520B Woodturning Lathe did just that. Its remarkably heavy-duty construction, lots of high-end features and virtually unlimited expandability made the POWERMATIC 3520B Woodturning Lathe a huge seller for POWERMATIC. 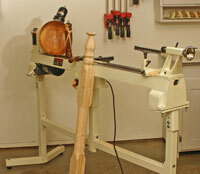 It also tops the list of gotta-have machines for a large portion of the NewWoodworker.com LLC woodturning community. Just when we thought the hybrid table saw craze had fizzled out, along comes the JET ProShop Saw to take this table saw style in a new direction. JET applied their considerable engineering and manufacturing capabilities to the JET ProShop Saw and came up with a new version with a list of features and updates that quickly piqued the interest of enough NewWoodworker.com LLC viewers to narrowly miss this years Top Ten List. Have a comment on this article? - Email Me!